Remember that telescoping magnet we talked about a few weeks ago? That thing is So Dang Handy! If I didn’t convince you that you need one for needle-hunting-and-retrieving, let me show you a new use for it. It makes a terrific thread holder! I’ve been sorting and trying and comparing threads a lot lately, and the other day, I ran out of space for sorting. If I only had some handy-dandy little peg arm thingy sticking out of the wall, where I could hang skeins to sort them, I said to myself. And, lo! My magnet called to me. It said, Extend me. I’m awfully grippy. I can do it! And, lo! It did do it! And I’ve been using it to hang threads on ever since. Of course, for this to work, you have to have the right kind of surface close by. I have the sides of my metal cabinets right next to me, so that works well. I also noticed that it sticks to the main shaft of my light. And it also sticks quite readily and almost a bit too eagerly to my Needlework System 4 stand, but I don’t like using it there, because there’s too much movement and I wouldn’t want to knock it off and end up with thread on the floor. So there’s a new use for a telescoping magnet. Works in a pinch! This week, I’m putting my mind to coming up with a simple dowel system to drape threads on. Nothing fancy – just a little something for stray threads while I’m working on projects. I have the picture of what I want in mind – if it comes off, I’ll share it with you. And who would’ve thought you can even accessorize your magnets? Marilyn sent in a photo of hers, with a case she made for it. She said she buys the telescoping magnets at hardware stores and makes cases for them using scrap needlepoint canvas and stash threads – and she gives them as gifts. Brilliant idea! Love the case! That’s our Tool Talk for the week! Coming up later, a beautiful new book on the market (sorry to throw temptation in your way, but … it’s gorgeous), and the stitching gets underway on the Secret Garden project. I’m sure there’ll be a few other little tidbits in there, too. 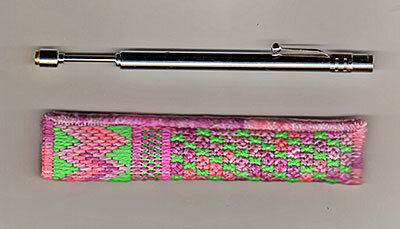 Do you have any favored needlework tools that you repurpose and use for something other than their original intended use? Would love to hear about them! Feel free to share them with us in the comments below! Great idea! Never thought to that but will incorporate it into my things to do when stitching. Thanks. You mentioned trying to set up a simple dowel system to hold your threads. I don’t know if this would work with your cabinets, but how about one of those swing-arm towel holders that are found under kitchen sinks? (They are generally metal, not wood.) They have 3 arms which swing out from the wall–you could triple your holdings! Why not try one of those indoor laundry hangers. It collapses and easily stored.Just set it up as you need it or you can move it around without any trouble. After reading about re-purposing things, the image that immediately came to mind for your “simple dowel system” was Tinker Toys! LOL!! For sorting long hanks of thread, how about one of those scarf/tie hangers that has the multiple horizontal rods that swivel out? Oh thanks so much for this what a good idea. I’m always have loose thread when I’m working on a project and constantly hanging thread ready for the next stitches and nowhere to put them I could hang this on my magnifier as I sew ready to use on the relevant project. I haven’t got one of these yet as I wasn’t sure if they were any use with carpet floors do you know if they are? but it would be worth buying one just to use as a thread hanger, great idea? Thanks for sharing this with us I do love your blogs on accessories. The magnetic wand is so strong that it does a super job on carpeted floors. The magnet works wonderful on carpet! It has saved my husbands feet more than once!! Lol! I do applique as well as embroidery and use those tiny little pins(sequin pins) and must run the magnet across the carpet before I quit for the night. I never seem to have a problem, but my husband always seemed to find the pins before I used the magnet. A must in my tool box! Thanks Marie for letting me know I ordered one yesterday can’t wait to receive it. Thanks for letting me know I ordered one yesterday. Remember those old wooden coffee cup trees? Those work GREAT for sorting threads. I find them at thrift stores all the time. I also just them when I wind bobbins for bobbin lace to keep my bobbins in order. I need to get one of those magnets. I had a needle sitting on top of my thread case…and forgot it was there when i flung open the top of the case. We still haven’t found the needle! It’s not a needle work tool, but I like to sort thread on a coat hanger for a project so there’s no tangling and when I’m not stitching I hang it and cover the thread with a clean hand towel. it makes it really easy to keep even the extra threads together and straight. One suggestion for holding thread is a pasta drying rack. Many different configurations to choose from. I have a one that collapses that I actually use for noodles! Exactly! Already got it out! The one I have is perfect for table top use…..
Susan and Mary, that was my thought too. I have a couple so I believe that I could spare one for threads instead of pasta! 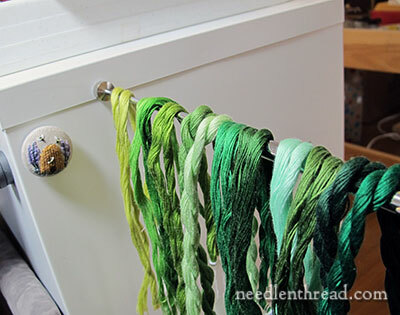 Another idea for thread sorting is a folding 3 prong towel holder. It’s intended to be mounted on the cabinet door under the sink…it swivels out for drying. It could be mounted on a door, cabinet or wall…bet you could even attach a strong magnet and attach it to a metal surface. I use a toilet round brittle brush to pic up all the threads that fall around my sewing space. Works great. Ikea makes the best rods for hanging things. My favorite is a vertical rod with short rods that screw in and stick out from it. Brushed nickel look and I have them all over the house including the stitching room. Another favorite is the one made for the laundry with 4 arms that can be pulled out in staggered positions and each arm is about a foot long. This can be wall mounted or bought on a floor stand. That is genius, Mary. I would never have thought of doing that – very useful, thank you. I love the little case Marilyn has made as well. Marilyn has a great gift idea! Thanks! Certain tie racks (that would get mounted in a man’s closet possibly) lend themselves very well. Some times the pegs will fold in out as needed. This only works for very small projects, and I’ve not tried it with thread heavier than DMC floss, but I punch holes in those annoying cards that come in magazines and sort thread in those. If the strands are relatively short (no more than 18″) and you’re working with less than 10 colors, you don’t even have to loop or tie them through the hole, just threading the bundle through is sufficient to keep them separated and easy to pick up when you need a new color. I make a lot of small xstitch hardanger or beaded ornaments as gifts, and those projects typically only have 4 or 5 colors of floss. I love the pasta drying rack idea, tho. That’s a keeper. Unfortunately, deadly allergic to them, although there is one in the neighborhood that seems to think my porch is Home. All Products On Sale – Buy Now! Since my cats think “what’s mine is theirs,” I keep the threads I am using in a basket so I can cover them up. Not convenient but I like the company they provide. Since I stitch right by a window, I sometimes use a thin, round curtain rod, the kind with rubber tips and adjustable length, to hold threads. Speaking of magnets, I have a couple of two Tesla rare earth magnets. They will lift the Universe if I let them — but they do pin and needle duty tucked into the toe of an old pair of pantyhose . Having had to pick up a whole box of pins from time to time has taught me the wisdom of sweeping over the floor then taking the magnets out of the hose – the pins pretty much drop in their box. When not in use they live on the underside of my ironing board or pot rack. I use Altoids type tins for needle cases and project boxes. The ‘mini’ ones hold needle threaders and a bunch of needles with a ‘puck’ magnet. The regular size ones get a strip of flex magnet and will hold a small pair of suture scissors, threads, laying tool and ripper… and whatever else I need that day. For ‘sticky sticks’ that can go on any smooth surface I have a handful of kids’ suction cup arrows. They are unfortunately appealing to the cat. How about a spaghetti drying rack to sort and hold threads !! Check out the tools bobbin lacers use to manage pair-wound bobbins. Sometimes they are parallel dowels between uprights, sometimes they are a bit like umbrella ribs. Or look at Lehman’s Amish hardware store for wall-mounted towel racks.